What is going on next summer? 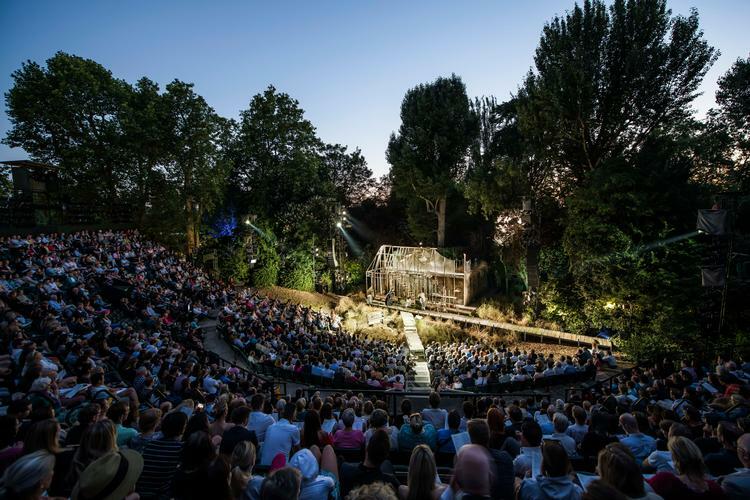 Regent’s Park Open Air Theatre have today announced their 2019 season. Opening the season, Thornton Wilder’s Pulitzer Prize winning play Our Town (16 May – 8 June) is directed by Ellen McDougall, Artistic Director of the Gate Theatre. Directed by Timothy Sheader, and continuing the 2018 collaboration which brought The Turn of the Screw to the Open Air Theatre stage, Regent’s Park Open Air Theatre and English National Opera present Hansel and Gretel by Engelbert Humperdinck (14 June – 22 June). A Midsummer Night’s Dream (28 June – 27 July) returns to the theatre for the first time in seven years in a new production directed by Dominic Hill, Artistic Director of the Citizens Theatre, Glasgow. To conclude the season, Jamie Lloyd directs Tim Rice and Andrew Lloyd Webber’s Evita (2 August – 21 September) as Jesus Christ Superstar transfers to the Barbican (4 July – 24 August). Our Town (16 May – 8 June) celebrates what it means to be human, the bonds that hold communities together, and our relationships with the ancient past and the eternal tomorrow. The Pulitzer Prize winning play is directed by Ellen McDougall, Artistic Director of the Gate Theatre. Ellen’s credits away from the Gate include: The Wolves (Stratford East); Othello (Shakespeare’s Globe); The Remains of Maisie Duggan (Abbey Theatre, Dublin); The Glass Menagerie (Headlong); Anna Karenina (Royal Exchange Manchester) and Ivan and the Dogs (Olivier Award-nomination, Outstanding Achievement in an Affiliate Theatre/Actors Touring Company/Soho). Regent’s Park Open Air Theatre and English National Opera continue their 2018 collaboration with a co-production of Engelbert Humperdinck’s opera Hansel and Gretel (14 June – 22 June). Sung in English, members of the ENO orchestra will be conducted by Ben Glassberg, with direction by Open Air Theatre’s Artistic Director, Timothy Sheader. Dominic Hill, Artistic Director of the Citizens Theatre, Glasgow, then directs a new production of Shakespeare’s A Midsummer Night’s Dream (28 June – 27 July). Whilst at the Citizens Theatre, Dominic has won Best Director in the Critics Award for Theatre in Scotland (CATS) for Oresteia, Crime and Punishment and Betrayal. He previously directed Peer Gynt at Dundee Rep (in a co-production with National Theatre of Scotland), which won four CATS and transferred to the Barbican. The 2019 season concludes with Tim Rice and Andrew Lloyd Webber’s Evita (2 August – 21 September) directed by Jamie Lloyd. The musical premiered in the West End in 1978, and features a chart-topping score including Don’t Cry For Me Argentina, Oh! What A Circus, Another Suitcase in Another Hall, and the Academy Award-winning You Must Love Me, originally performed by Madonna in the motion picture. As Artistic Director of The Jamie Lloyd Company, Jamie is currently producing and directing Pinter at the Pinter, a season of Harold Pinter’s short plays in the West End. The Regent’s Park Open Air Theatre production of Jesus Christ Superstar transfers to the Barbican (4 July – 24 August), ahead of a North American Tour in the autumn. Casting to be announced.